The world of DIY cleaning can get a little silly. Dryer balls. Soap nuts. It all sounds a bit…inappropriate, right? When I first heard about soap nuts I thought, “Really? Are people REALLY cleaning their laundry with nuts?” I thought it was taking the green cleaning movement a little too far. But then I talked to a woman at a local farmer’s market who was selling soap nuts and I decided I had better jump on the chance to try one more method of green cleaning. Mainly because they sounded too good to be true. I had only heard of them being used for laundry, but the woman told me I could clean almost ANYTHING in my house with them! And hey, I’m always game for simplifying things. Soap nuts really aren’t a nut at all. They are a berry that is grown on a tree native to Himalayan regions of Nepal and India. This berry is generally referred to as the Soapberry because it produces a natural soap, called saponin. Saponin is a natural surfactant that foams when dissolved in water, removing dirt and odors from surfaces. These Soapberries are normally wild-harvested from trees that have never been sprayed with any chemicals or pesticides – there’s no need because pests don’t like the taste of the fruit. Once harvested, the Soapberry is dried and de-seeded. They end up looking like a little brown nut – hence the name. Since they don’t really belong to the nut family, they are absolutely safe to use around family members with nut allergies! Soap nuts are extremely gentle, 100% natural, and chemical-free, making them perfect for even the most sensitive skin or delicate surfaces. This eco-friendly option is also naturally anti-bacterial, anti-fungal, anti-microbial and a very powerful alternative to chemical cleaners. Your soap nuts can be used to clean the entire house and all of your laundry – it’s true. There are two main ways to utilize soap nuts. This method works best with laundry washed in warm water because saponins are released better in warm water. If washing on cold, simply steep the bag of soap nuts in a few cups of hot water for several minutes (to release saponins) and add to your cold load of laundry, or use the liquid concentrate (see next paragraph). This is my favorite method because I love having a liquid cleaner that I can spray or squirt onto surfaces for easy cleaning. You can use this concentrate to clean anything – sinks, floors, dishes, countertops, stovetop, bathtub, toilets, cold or warm laundry loads, cloth diapers, fruits & veggies, glass, carpets, and more. Note: recipe adapted from Shecology™. 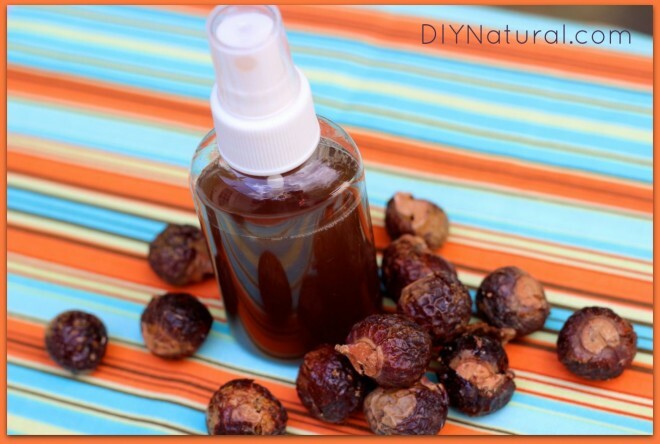 Combine soap nuts and water in a medium pot. Bring to a gentle boil. (Watch the pan carefully so suds doesn’t boil over!) Reduce heat, cover, and allow to simmer for 1 hour. Allow liquid to cool, then strain and add essential oils for scent. Transfer liquid to a sealed container. Compost or discard soap nuts. Note: I should warn you that your house will smell a little funky while your soap nuts are boiling on the stove. Like any other botanical water-based liquid, your soap nut liquid cleaner will go bad after a period of time. If keeping at room temperature, store in a small bottle that you can use up within a week or so. Refrigerated liquid will keep for a few months. If you make large batches, simply freeze portions of your concentrated cleaner to ensure freshness. This liquid cleaner is perfect for HE washers because it produces very little suds, but works in any type of washer. This concentrate is great for ANY temperature of wash cycle, and is the preferred method when washing with cold water. (The whole nut works well in warm/hot water, but sometimes cold water won’t release the saponins needed to clean laundry.) Use 2-3 TBSP of your homemade concentrate for large loads of laundry. Your soap nut cleaner is free of chemicals or perfumes, so it’s perfect for cloth diapers or even hand washing delicates. Add your soap nut cleaner to a squirt bottle and use about 1 TBSP per sink of dishes. I like to fill my dish wand with the liquid soap for hand washing dishes. They come out sparkling clean without any residue. Add your liquid concentrate to a spray or squirt bottle. Use generously in and around the toilet bowl and lid. Allow to sit for several minutes and then clean as usual. This all-purpose cleaner is also great for mopping floors. Add 1 TBSP of liquid to your mopping water. Spray on, allow to sit for several minutes, and wipe with a clean dry cloth. Rinse with clean water if desired (especially if using as a fruit & veggie wash) and dry. Could it be possible that we might only need these silly little nuts to clean almost everything in our houses? Seems too good to be true, but other cultures have used them for centuries before we caught on. You’ll have to use them and be the judge. 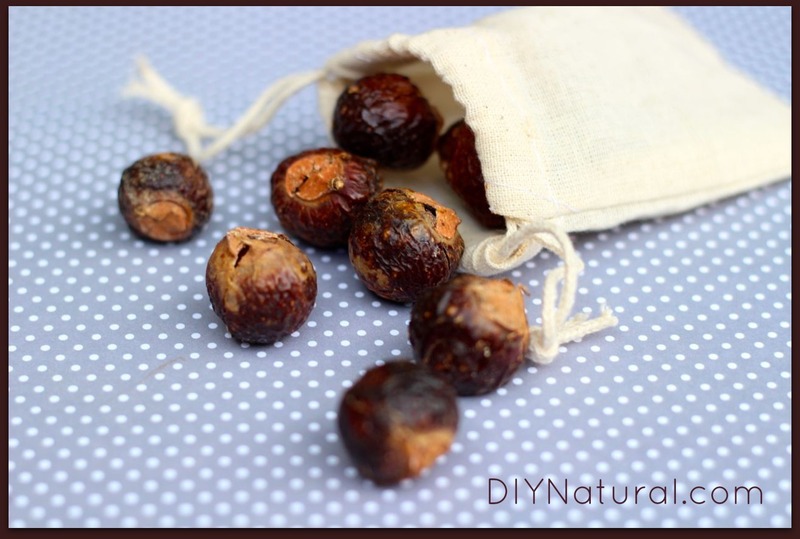 If you haven’t tried soap nuts yet, it’s time to give them a shot! Are soap nuts safe to use on granite countertops? I know it is not good to use vinegar based cleaners on them, would this work? Does anyone know? Yes, soap nuts are safe for use on granite. They are very gentle, and contain only natural surfactants, so won’t harm granite surfaces. Would you use this recipe as a concentrate? In other words, when putting in a spray bottle for surface cleaner do you dilute with water, and if so, in what concentration. Also, for the toilet bowl cleaner – concentrated or diluted? Good question Lesa! Use this liquid cleaner at full strength. Do not dilute with water. If you use it full strength it is at the right concentration to kill the specific germs listed in the above article. I found it to be both… really made my hair shine, but I found the smell nauseating… so I rinsed with cider vinegar then washed it out and was extra shiny. If using the nuts for your hair, I’m assuming you would use the liquid concentrate as a “shampoo” instead of your homemade shampoo, correct? Are the nuts good for conditioning too or just as a shampoo? oops… sorry, read below. I didn’t press reply and my answer is a separate post. I’m just starting to move into using more all natural products and wanted to try out an all natural laundry detergent. Would you suggest soap nuts or your recipe for homemade laundry detergent? We like them both! So it just depends on how available the ingredients are in your area and which method seems easier for you. The great thing about the soap nuts is that you can use them to make the all-purpose cleaner for the rest of the house, but the liquid concentrate has to be stored properly or it will go bad. With the laundry detergent, you can also use the leftover borax and washing soda to clean so much more. Where do you get soap nuts and how do you use them to wash your hair? 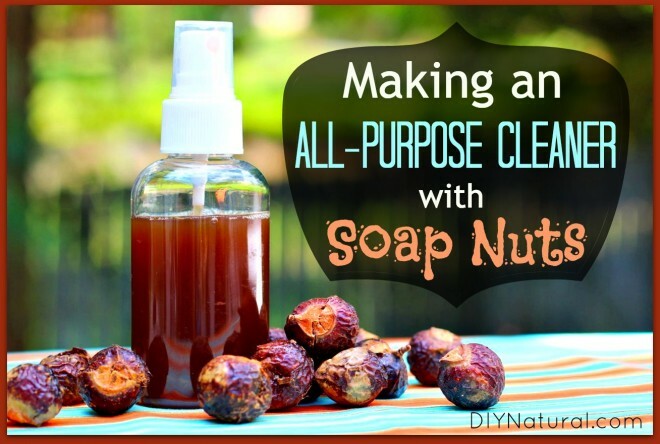 There is a link in the above all-purpose cleaner recipe for buying soap nuts. I’ll actually be writing about using soap nuts to wash your hair very soon! How much of soap nut liquid do you end up with after boiling and straining? I assume some water will be lost due to evaporation? You will end up with around 1 cup of liquid. This may not last long in some households, so you may choose to make larger batches and refrigerate or freeze. Has anyone tried soap nuts in any form in their dishwasher?? I have tried all sorts of dishwasher recipes and formula but can not find one that suits our chlorinated, flourinated (don’t start me off here) water does not cause a slimy residue on glass and plastics. I feel an experiment coming on… hmm. Any suggestions anyone? I haven’t put the liquid concentrate in the dishwasher yet, but you should try it. You may want to put the cleaner in the pre-wash compartment, and then put citric acid in the main wash compartment. The citric acid will help with residue on dishes. Be sure to return and let us know how it goes if you do try it! They are better for general laundry purposes, not necessarily stains. You will need to pre-treat stains as you normally would. Yes, soap nuts are a replacement for laundry detergent. Your soap nuts will usually come with a small muslin bag that you fill with about 5 nuts, then drop directly in the washer with your clothes. See more details for using them in the laundry in the above article under the heading “Using the whole nut.” Soap nuts are perfect for HE washers! You can also wash yourself and your hair with them! They really are little miracles!